The Oblivion Oath, a Pathfinder Second Edition Actual Play Twitch Stream, premieres this Thursday, April 4 at noon Pacific time! Over the past month, each Oblivion Oath player has taken the time to sit down with Dan Tharp, the producer of the show, to talk about their character and reveal a bit about what makes them so special. If you missed these broadcasts, catch them all on our YouTube channel! 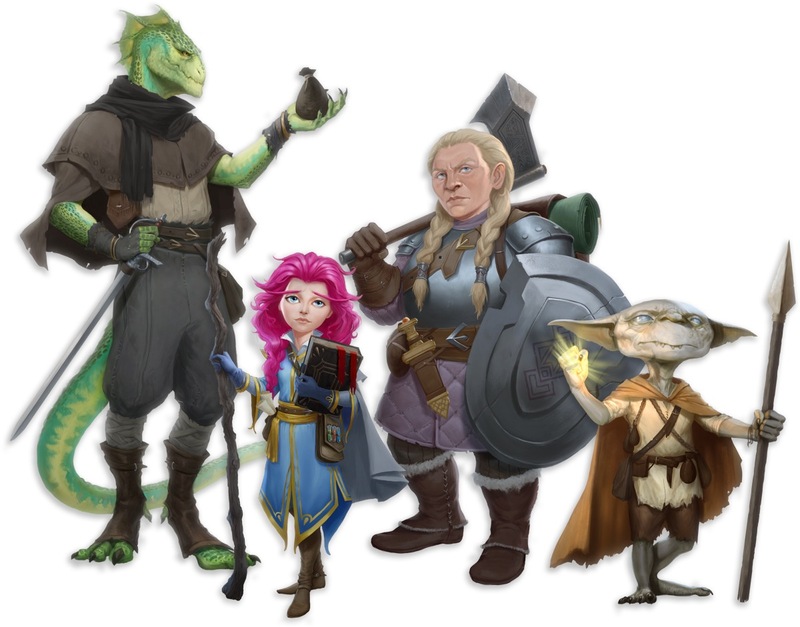 Join us during the broadcast to chat with other fans of the show and watch us play LIVE on Twitch every Thursday to learn more about this exciting story and get a sneak peek at Pathfinder Second Edition! Did Captain Heliana take the Assurance feat? Why Lizardfolk and not Iruxi (sp?)? in the character link? Because I did not want to spend the words to contextualize it properly here. We generally reference monsters by their more common name in print to make them easy to find, including the name for themselves along with it to help ease the translation. Wouldn't it be "Large pickley creature" then? Pencil, paper, and rulers out and ready! You're going to show me those dying rules, Jason! I Assure you of that! So I guess you took the Assurance feat then? Podcast? Pretty please? With cherries? And hugs? Please? Each week's episode will be viewable after the livestream either through Twitch or on Paizo's YouTube channel. I am sad to hear that. I do not have the time in my schedule to watch the videos (either live or VOD). I also do not want to jump through the hoops to rip the audio myself (or steal it). I hope that you reconsider at some point, it's a missed opportunity for you. I don't think it would be that great to have only the audio for that game. They are not professional streamers, and they are playing face to face, so I would be pretty sure that missing the visual cues will be quite confusing to an audio-only listener. That would need more scripting and/or editing than they really have the time/money to do for this. This is not a podcast or a discussion. That's mainly a game they will play for fun, and as a tease. I may be wrong too. I guess we'll have to see with the couple of first episodes. At worst, I'm pretty sure someone in the community will do it. I've relatively recently discovered Critical Role and am enjoying it immensely but can rarely make time to actually watch. Probably 90% of the time it's audio only for me and the references to the map, the comments of "he attacks....you!" and so forth are pretty easy to follow with context, albeit I'm sure I miss a few clues here and there. If it's a relatively easy thing to do technically, I would love to be able to listen to this as an actual play podcast, rather than as a twitch rerun. I have a chrome extension that lets me click a button to make youtube audio only. I imagine something like that would work. Wait, a dwarf "CHAMPION"? What class is that? Was that in the 2nd Edition Pathfinder playtest? Champion is the name given to the class formally known as Paladin, and the term Paladin has been reserved for Lawful Good Champions. I guess that answers whether the Champion (which might get 8-9 flavors) needs to match their deity exactly. I guess that's consistent since Shelyn and Sarenrae had Paladins already. I would assume that PF2 will follow the playtest in specifying exactly which alignments each deity allows for cleric, and that the same list will carry over to champion. Excited for this. Have to catch it in replay. I work night shift, and probably won't be awake in time. But I'm checking it out later in the day, for sure. Looking forward to watching the replays and discovering all I can about 2e! Indeed! I, too, will be looking forward to having a listen searching for new information. They've been talking about doing this for some time, so the only April Fool's joke would be it being the 4th rather than another day in the near future. I suspect it's not even that. This picture is notable (if not unique) for the Goblin having a closed mouth. There are four PC interviews/reveals up on twitch from the last four thursdays. This is legit. That could actually be a time for someone from Europe to watch live. About how long would a typical show run? 2 hours? 4? I think they said an hour. Not sure where though. One hour only, date was confirmed previously, content will be examined and data posted in stream write-up for those interested in crunching numbers. And yes, I took Assurance (Lore PF2) a while ago, but it just recently became a good feat. On the other hand, one hour is a good short show to watch. Still would have expected at least 2 hours per week. I daresay they’re testing the waters. It ties up six pretty key staff members - if there’s not a lot of interest, i guess it’d be hard to justify more than an hour a week. Hopefully it takes off and expands beyond just the pre-launch hype season. I’m certainly keen to listen to it long term. Let's also be clear: Even though they're playing a game, it's a game that they've been working on or adjacent to for years, and they're playing with their coworkers. Please don't demand them to use their free time after work on this! Folks who are interested in audio-only: the Twitch mobile app has a setting in it so that when you leave the app, it will continue playing just the audio. Thanks guys! I had seen Marko Horvatin's work in the past but I wasn't recognizing it - thanks again! I'd also like it in podcast form. Listen to it while driving without data. On any modern device there are numerous free ways to download videos such that you can put them on while driving without data. Now that today is April 2, is this actually happening? Unfortunately, it's an opportunity we're going to have to miss at this time. We don't have the resources to do an additional audio-only edit of our streaming content for release beyond the YouTube channel. If the stream takes off and our viewer numbers both live and after the fact are high enough, though, who knows what resources we'll be able to make available down the road. While I don't want to presume to tell you how to do things in your own life, I have found myself in a similar situation in the past. I found that I could play YouTube videos in the car and just set my phone screen-down so I was only getting the audio through the sound system instead of distracting visuals. It worked really well for what I needed it for. In fact, I've done the same with live Twitch streams or replays of Twitch videos, too. At that point it's basically a podcast as far as my experience goes, since it's the same during my commute if I'm listening to a podcast, an audiobook, or a video. Whoa, whoa, maybe I missed something.. but lizardfolk? Are we getting them as PCs in the completed PF2? No, not in core at least. That is a homebrew ancestry that they made for the show. “this definitely sounds hype” ????????? ?